A new market entry is a truly exciting opportunity for companies that are seeking ways to grow and expand. While there are several strategies to grow a business, companies that provide globally relevant offerings and unique value propositions should strongly consider growth by entering new markets. While expanding a business into a new market (some also call this internationalization) is a complicated and theory-heavy topic, in this article, I will present it in an easy-to-understand way. I have selected some, in my opinion, of the most important things that you need to know in order to choose the market entry mode, that is the most suitable for your business. In this article, I am going to present you everything you need to know in order to be able to implement these two steps and get ready for a new market entry. 1. How to choose a market? While many markets can be great for your product, you should start your internationalization process in small steps. Whether it is 1 country, or a group of highly similar countries (e.g. Scandinavia) the first thing you need to do is research. Research is truly essential for successful market entry and will also lay the basis for designing your marketing strategy afterwards. The Market. How big is your market and is it growing? What are the trends, buying behaviours and buying power? Is there a product/service fit for your offering? The Competition. Who are the main players in the market, their market shares, prices and profiles. It is extremely important who you are going to competing against! The stage of the market development. Do the buyers perceive this product category you are in as new and innovative? Market accessibility. Legal environment, import costs, ease of entrance. Basically, how hard will it be for you to establish yourself in the new market? Culture. How close of different culturally is the new market from your current one? Political and economic stability. Depending on the product, it probably wouldn’t pay off to invest too much into a market within a war state or strongly fluctuating currency. Business objectives. How does this market align with the objectives of your business? Benefits and disadvantages of this market. How does it position itself to other markets that you are considering? After you have selected the most promising new market, you should start considering the entry mode. 2. How are the market entry modes classified? To really understand the market entry modes, it is essential to know how they are different. Basically, market entry modes are often classified by the degree of investment and risk versus degree of ownership and control. 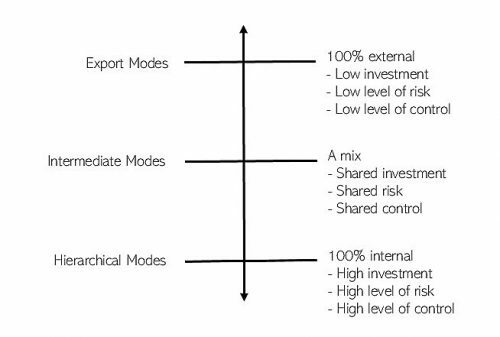 The modes that require the least investment, has low risk and offers low control are called Export Modes. These are purely based on externalization, which means that the only thing you will be responsible for is delivering the product to your foreign partner. The opposite of these are Investment Modes that provide high control over your business, but also requires high investment and thus comes with a high risk. The Investment Modes are based on internalization, thus these modes the only ones that do not require a partnership. In the middle of these lie, so-called, Intermediate Modes which are based on shared ownership, thus also offers shared investment, risk and control. 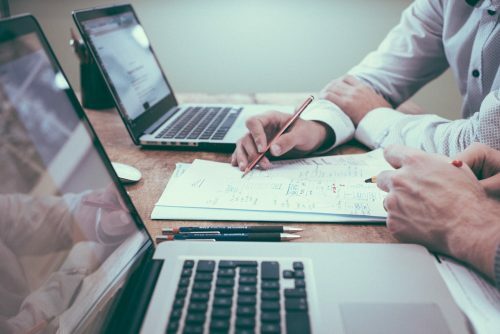 The Intermediate Modes offer an opportunity for those, who want to keep part of control over the business, but at the same time share the risks with a partner. 3. What are the types of entry modes? Non-equity. What this basically means, is that your investments will be low. You won’t need to invest in equity, e.g. offices or factories. Equity. Being the opposite of non-equity, this type of entry modes requires high investment in equity. Equity entry modes are also called Foreign Direct Investment modes (FDI) because a foreign company (you) makes a direct investment into a local market. 4. Which market entry possibilities are there? Now that we already looked into how the internationalization modes are being classified, let’s take a look at the modes themselves. 1. Export is the least investment and risk requiring market entry mode. What export means in itself, is that your products go to a new market, but you don’t. Indirect Export. This type of export requires a third party, someone who takes control of the selling process. The essential difference of this kind of export is that you, as the exporter make a contract with the middleman, who then sells the products to the actual buyer firm. Direct Export. Very similar, except that there is no middle party – you sell your products directly to the buyer firm. This mode requires more a proactive involvement as a supplier, as well as financial and marketing commitment. 2. Contractual Agreements - legal agreements between you and a foreign partner, allowing to share knowledge, technology or brand for a price. Franchising is a form of Licensing, also based on royalty payments. The main difference between the two is that as a Franchisor you would be able to have much more control over what the Franchisee “does” with your name and your products. There are also a couple of other differences: the franchise has to be officially registered, and the franchisee has to have its own territorial rights. Management Contract. Simply put, your management would go manage a foreign business for a set period of time, in exchange for e.g. % of sales. Even though through this mode you cannot really expand your own business, you may gain some unique insights into the foreign market. Turnkey Operations. Does your company build things? Then this might just be the perfect mode. TOs specifically concentrates on long-term construction projects, such as roads, railroads, airports etc., that are outsourced to you by a player from the local market. Contract Manufacturing. Do you produce things? An option for you could be to outsource your manufacturing operations into a cheaper market, such as Poland or China. This mode allows you to share technologies and practices, while at the same establishing yourself in a new market. 3. Alliances are a type of entry mode, where you with a partner establish a new business together or merge your companies permanently into one. Joint Venture is a mode where two partners join their forces and make a new separate company together, in order to achieve a certain goal, while at the same time keeping their original companies intact. The shares of the new business are divided equally (50/50), and so are investments, responsibilities and risks. JV is a mode, which really makes sense when each of the partners can offer something to the table that the other partner does not have (e.g. technology or market knowledge). It is important to mention that JV’s is a “temporarily” option and the company usually dissolves once the goal is achieved. Strategic Alliance. Similar to JV described below, Strategic Alliances mainly differ due to the fact that the partners do not own equal shares, investments and responsibilities. A Merger. Again, very similar to the two options above with one main difference: a merger is a permanent option and the companies participating actually become one. A merger can include more than 2 companies and allows to divide the shares somewhat equally. 4. Opening a Wholly Owned Subsidiary is as far as you can go! What it means is opening a foreign subsidiary. Your current company would then become a parent company and own all the stock of the daughter company. The main advantage of any WOS is that you keep all the control, all the knowledge and core competencies to yourself. At the same time, the main disadvantage is that you are bearing all the risks alone. Aquisition. If you don’t want start from scratch, an acquisition is the way to go. Just purchase more than 50% of shares of an already established company in the new market. Beware though, the company will need to go through a chain of change processes, before it is fully integrated into your culture and operational habits. Greenfield Investment. If starting from 0 is something that you prefer, then make a greenfield investment. Your task here will be to establish a whole new entity in the foreign market – the entity can be a manufacturing plant, office, warehouse or similar. The only difference here from starting an actual new business is that you can transfer your brand & marketing efforts, culture and operational routines. Remember though, every market is different, so you will need to adjust all of those to fit the new market. If you want to avoid of actually building the buildings yourself and buying land, look into Brown Field investment. 5. How to choose an entry mode? Now you have a really good understanding of the different market modes. But still, how do you make that big choice? Remember - there is no single right answer to which market entry strategy is the best. 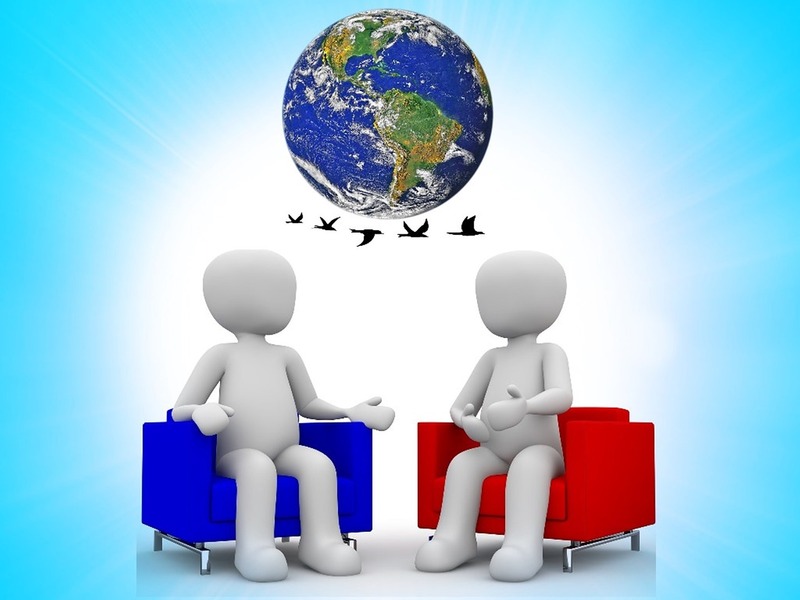 In reality, it truly depends on the type of your business, resources available, goals and the foreign market itself. Like in many cases in life, the higher risk mode of export you choose, the higher returns it may bring. However, there is always a risk, and it is your future partner, whichever mode you decide to choose, who is going to help you to handle those risks, or even share them. On the other hand, the fewer partners you involve, the more of the profits will go to you directly. Let’s say you are exporting awesome oak furniture. If you decide to export directly, you definitely have more responsibility. You need to find the buyer company in your new market, make a contract, stick to its agreements, provide marketing guidelines etc. But, you do sell directly, which means that you can earn quite much more money, as there is no middle partner. On the other hand, in the indirect mode, there would be a middleman between you and the actual buyer. While the middle partner would normally take a big part of your responsibilities away, he would also take a part of the earnings, or bargain a lower supply price, so that he would be able to sell your furniture to the actual buyer. I mean, now there are 3 parties who will have to make profits from your products, right? Finally, your first market entry mode does not need to “be forever”. If you start by exporting and notice that the turnover from that market is actually really good – make a bigger investment! 6. How to choose a partner? As you probably already noticed, in many cases, when entering a foreign market, you will need a partner. Whether you decide to export, sign a contractual agreement or create a new joint business, finding the right partner becomes one of the main success criteria. Choose someone financially stable. You wouldn't want your partner to go bankrupt or retreat in the middle of the process, would you? Choose someone strategically relevant. Does your partner have the specific resources that you need to succeed in a new market or innovate? Make sure you are getting something truly valuable from the partnership. Choose someone you can trust. Partnerships are, of course, based on contracts, but they are also based on trust. You will be investing in this partnership, so make sure that your future partner is credible. Choose someone with the right values. Building on the previous point, someone who shares your vision, values and ethic norms will be much easier to work with, build trust and respect. So, take a good look at your business and goals, now that you know the prerequisites of choosing a market and the market entry mode, you can make the right decision. Your next steps after you have chosen the right market and the right mode should be: A. Designing marketing strategy + B. Implementing it. If you need assistance with doing your market research or designing a marketing strategy, Desk Research Group can help you!